Anthony Peardew is the keeper of lost thing—rescuing objects others have dropped, misplaced, or accidently left behind—and writing stories about them. As the end nears, he bequeaths his secret life’s mission to his unsuspecting assistant, Laura, leaving her his house and and all its lost treasures, including an irritable ghost. The main storyline of The Keeper of Lost Things follows Laura who attempts to reunite lost things with their owners. Originally collected by her deceased employer, Anthony Peardew, the challenge the lost things poses for Laura leads to her discovering more about herself and the life she wants. Running alongside Laura’s story is that of Eunice and Bomber’s friendship which begins in the 1970s. Short stories written about the original owners of some of the lost things, and how they were lost, are interspersed with both of these timelines. I was a little put off by the switches back and forth between characters and times, but I gradually became accustomed to them, and by the half way point I barely noticed them at all. I did wonder how all the stories would come together, and tried to pick up on all the hints and clues thrown along the way. A good book is one that makes you care about the characters and I certainly did in this case. Each of the main characters was given enough complexity to feel real, and the secondary characters supported the storylines brilliantly. I became annoyed with Laura at times, even though she was a main character, and felt that Freddy’s relationship with her was understated. I especially liked Sunshine and Eunice, and laughed a lot at Bomber’s sister, Portia. 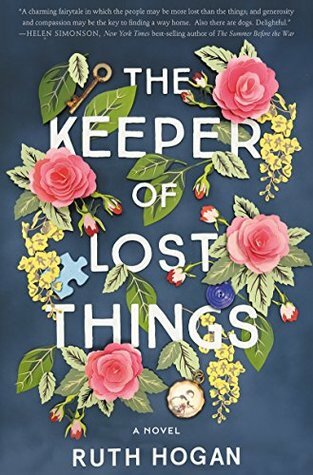 The Keeper of Lost Things is a beautifully written story about love and friendship, loss and redemption, with a little of the supernatural thrown in for good measure. It feels a little slow to get going in the beginning, but quickly builds up momentum. I wish I’d thought to keep a box of tissues handy – I never expected the ending to move me as much as it did. Highly recommended for anyone wanting to read something a little different. My thanks to Hachette Australia and Netgalley for an advanced reader’s copy of The Keeper of Lost Things.